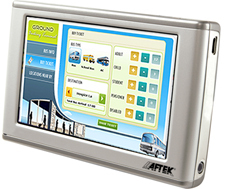 Aftek's depot manager software is designed for road transport organizations. It facilitates centralized data management, optimum fleet scheduling, fleet maintenance, crew management, cashless operations with smart cards, and MIS. Depot manager reduces pilferage, helps faster decision making, and generates revenue. It is capable of handling multiple depots and buses at different geographical locations for any road transport organization. It has a centralized data repository which also generates MIS reports. Depot manager coupled with Electronic Ticketing Machines (ETM) helps to generate electronic data. Later, this data is available centrally for fleet fuel filling information, average running per liter of fuel, passenger loading, tickets, cash, revenue, and revenue per kilometer analysis. Various alerts like expiry of drivers' license, expiry of bus fitness certificate, expiry of bus road permit, expiry date of bus insurance, and expiry date of vehicle license. Depot manager has been successfully deployed at various road transport organizations globally. It has been astounding success at road transport corporations in Mauritius. It handles ticketing and depot management and issues more than 200,000 tickets daily at Mauritius. Road transport organizations typically have huge fleet of buses that operate from depots situated at various locations. These organizations use manual ticket issuing systems. Thus the daily or monthly transactions have to be consolidated in order to generate a future plan of action. For example, a decision has to be made to start a new bus on a route.On this route, the number of passengers and the revenue generated are of considerable amount. It is extremely essential to have consolidated data at hand in order to make this decision, plan the bus route and schedule. With the existing manual processes, it extremely time consuming and error prone. What if all this data is available at real-time at a central location? It would naturally be efficient, accurate and cost effective at the same time! Tracking the on-road buses and diverting them to the locations where passenger load is more is a prime need of the traffic division of the public transport organization. If the location of buses is tracked on the map using mounted GPS devices, diverting buses would be very easy. To reduce the load of issuing tickets, issuing the tickets at the starting stage would be very handy. Automatic fare collection system would be required as a next generation fare collection system. It would eliminate manual intervention and cash transactions while issuing the ticket. 'Depot manager' software focuses on easing the day to day tasks of the road transport organizations. Electronic tickets are issued by a conductor using an ETM. The ETM stores information like ETM number, date, time, trip number, passenger type, route of traveling, boarding and alighting stage, conductor number and driver number. Alternatively, a smart card based ETM is also provided to issue tickets using smart card. Data from the ETM is sent to the depot PC via depot manager application software. It is then sent to the central office using a dialup, ISDN or intranet connection. Using this centralized data, MIS reports are generated for the following categories: passenger data, revenue collected, scheduling, traffic and route analysis, comparison. GPS based bus tracking system indicates shows the on-line bus position on the GPS map. It enables the traffic division to take decisions immediately for unscheduled trips. Information about online bus status, bus location, onboard passengers, revenue collected, trips performed is sent using GSM based ETM to the control room frequently. Ground booking, enquiry terminal is an optional feature that can be used for issuing the tickets using ATM cards. It also acts as a query terminal to obtain information such as: buses between two stops, information about the nearby important places (bank ATM, Mall, historical places, etc) on the map. Automatic Fare Collection (AFC) system is an optional feature that serves tag-in and tag-out cashless ticketing system based on Mifare standards.